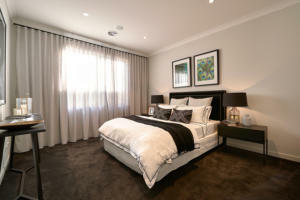 Each of the four bedrooms has a walk-in wardrobe, a feature even Carrie Bradshaw couldn’t say no to, as well as a formal living room at the front, an open-plan living room at the rear, and an outdoor room perfect for those warm summer nights. The textured cabinetry paired with the black stone in the bathrooms and kitchens adds depth and sophistication, and are some of Zoe’s favourite features of the Daintree 28. Our product development manager, Ian Pumpa, says family members can enjoy both personal and shared spaces thanks to the well-considered floorplan. 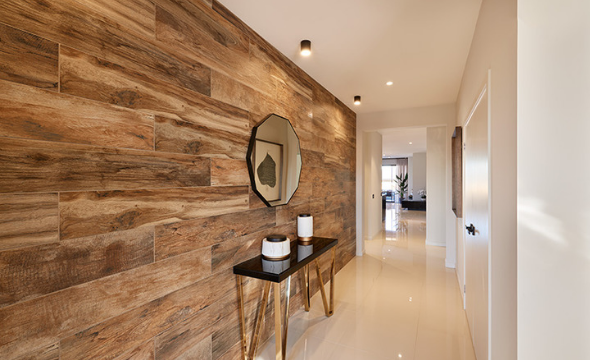 From the moment you step into the house, you’re welcomed by a timber-look tiled entry that leads into the open formal living room, a design that is both spacious and warm. “The formal living room is positioned well away from the family room, creating enough separation so both the home’s living spaces can be used without having an issue of noise transfer between the two,” Ian says. The main bedroom also sits at the front of the home, with the ensuite entry located just off thewalk-in wardrobe to emphasise privacy. 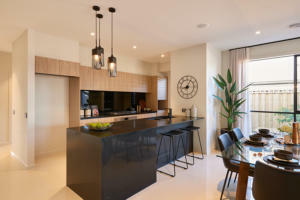 The kitchen serves as the main hub and showpiece of the house, with eye-catching black features leading into a matching communal space for easy modern living. Other benefits of this design include a walk-in pantry and a cedar-lined alfresco area off the lounge room. 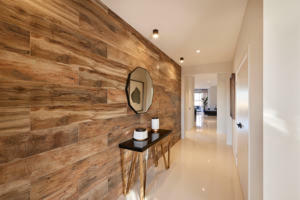 If you’re based in Melbourne and you would like to explore the Daintree 28 in person, feel free to visit our Display location in Wollert at the Aurora Estate by calling to make an appointment today!